I love zucchini but if you’re getting as much of it in your garden as I am, you may be looking for ways to use it up! Look no further- this is a one pot meal you can make in under 30 minutes. Perfect for a healthy lunch, dinner, or summer side, this meal is loaded with Vitamins A and C and potassium and fiber. It’s gluten free, grain free, paleo, SCD legal, and vegan- what’s not to love! Start by prepping – spiralizing, slicing, mincing- your ingredients. Heat some olive oil in a large pot over med-low heat. Add the garlic and onion and cook for a few minutes, until fragrant. Add the zucchini noodles, cover with a lid and cook for 2 minutes- stirring or tossing with tongs as needed. Add the halved tomatoes and cook for another 3-4 mins until the noodles are tender or cooked to your liking. Stir and toss as needed. Season with salt and pepper. When the noodles are cooked to your liking, remove the pot from the stove and add the basil and crushed red pepper. 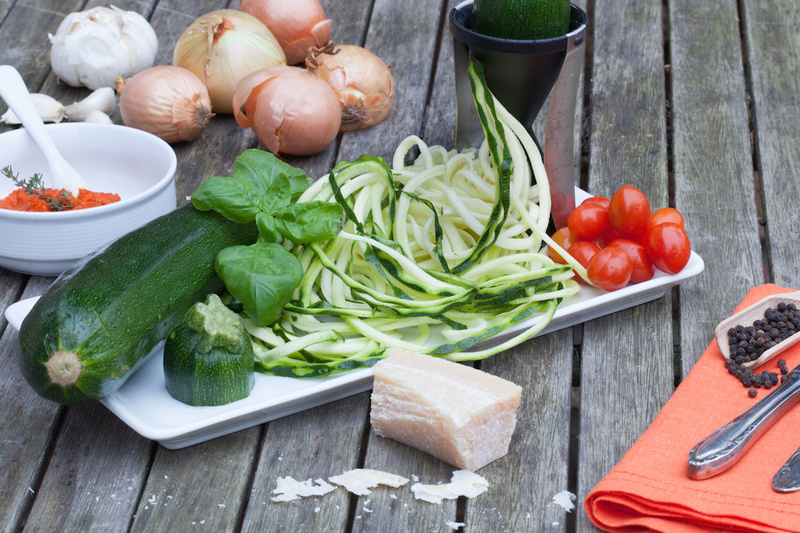 Enjoy!PS – It’s okay to eat your zucchini noodles (or cucumber) noodles raw and just add the cooked onion/garlic veggies to it!